In the few previous posts, we’ve already discussed the PST file size limit issue. An Outlook data file can’t store the mailbox data more than its maximum size limit. Most of the users have upgraded to the newer Outlook versions which support the Unicode format. The Unicode PST file can easily store up to 50 GB of mailbox data. But sometimes even the 50 GB size ain’t enough for Outlook users. In this article, we’ll learn how to increase Outlook mailbox size limit for Unicode PST files. Microsoft has released many versions of its Outlook client, i.e. from 97 to 2016. Microsoft Outlook 97 to 2002 use old ANSI format. On the other hand, the Unicode format is used by Microsoft Outlook 2003 to 2016. These days users are upgrading from an older Outlook version to a newer one. Why? The ANSI PST format has a maximum size limit of 2 GB. Also, there are other limitations for storing the mailbox items per folder. But the worst thing happens when the Outlook starts storing the mailbox data beyond the 2 GB limit without giving any warning. This would lead to corruption and result in data loss. Due to corruption, you would lose all your data stored in the PST file. In order to address these concerns, a new file format has been introduced, called Unicode, in Outlook 2003 and higher versions. Unlike old ANSI format, the Unicode format has a better size limit, i.e. 20 to 50 GB. Outlook 2003 PST file size limit is 20 GB, Outlook 2007 PST file size limit is 20 GB, Outlook 2010 PST file size limit is 20 GB, Outlook 2013 PST file size limit is 50 GB, and Outlook 2016 PST file size limit is 50 GB. Moreover, you’re likely to experience severe Outlook performance issues. An oversized PST file is always highly prone to corruption. Therefore, it’s strongly recommended not to go beyond the maximum size limit in order to avoid performance and stability issues. The Unicode format gives you enough storage space, i.e. 20 to 50 GB. However, you can easily reach or cross this size if you receive thousands of email messages every other day. It’s really important to keep the PST file size small and handy in order to keep Outlook performing at its best. There are two ways to do that: either you can split PST file into multiple parts or you can compact PST file size. However, the PST file size limit remains the same, i.e. 20 to 50 GB. 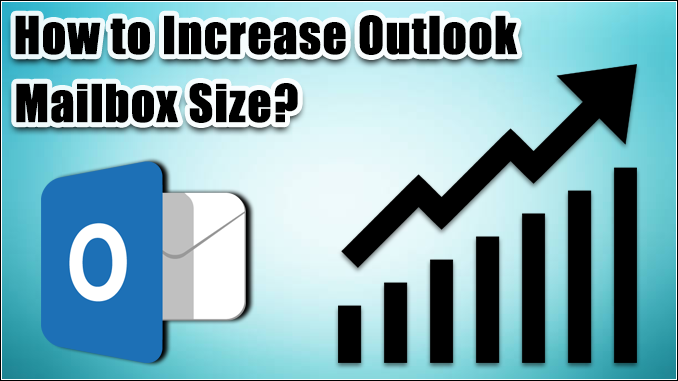 But do you know that the Outlook mailbox size limit can be increased? Yes, you’ve heard it right. You can successfully increase Outlook mailbox size by modifying the registry. Any Outlook version you’re using, i.e. from 2003 to 2016, you just need to follow a few simple steps which I’ll be showing below. Make sure you’ve logged in to your computer with an administrator account. Open the Run command, and enter “regedit” (without quotation marks) in the search field. Then press Enter. This will open the Registry Editor window where you need to modify the PST file size limit. But before that, you should take a backup of your registry (optional). On the Registry Editor window, click the File tab on the taskbar and select Export… in the options. On the Export Registry Editor window, define a location and filename for this backup REG file. Finally, click the Save button. Step 1: On the Registry Editor dialog box, double-click the Computer in the tree-structured list. Double-click the Policies > Microsoft Office. Now double-click 14.0 > Outlook. Step 2: Now click the PST folder in the list. If you don’t see the PST key under Outlook, you can create it manually. Click the Edit tab in the taskbar, point to New > Key. Type PST and press Enter. Step 3: The new PST key has been created successfully. Now create these two values: MaxLargeFileSize and WarnLargeFileSize. To create MaxLargeFileSize, click the Edit tab in the taskbar. Point to New and select DWORD Value. Here type a name MaxLargeFileSize and press Enter. To create WarnLargeFileSize, click the Edit tab in the taskbar. Point to New and select DWORD Value. Here type a name WarnLargeFileSize and press Enter. Step 4: Now double-click MaxLargeFileSize to define its value. On the Edit DWORD Value dialog box, enter the value data in MB. If you’re using Microsoft Outlook 2003, 2007 or 2010, the default PST file size limit is 20 GB. So make sure you define a size over 20 GB. Or if you’re using Microsoft Outlook 2013 or 2016, the default PST file size limit is 50 GB. So make sure you define a size over 50 GB. In this way, you can successfully increase Outlook mailbox size limit without using any 3rd party tool. Then choose Decimal in the base options. Finally, click OK. Step 5: Now double-click WarnLargeFileSize to define its value. On the Edit DWORD Value dialog box, enter the value data in MB. Note: Make sure you define 90% of the MaxLargeFileSize value. Now close the Registry Editor dialog box. The above DIY trick is easy and effective, however, there’s a major limitation. By modifying the registry, you can only increase Outlook mailbox size limit of a Unicode PST file. This means the above trick doesn’t work with the old ANSI PST files created by Outlook 2002 and earlier versions. So if you’re looking for a way to increase Outlook mailbox size limit of an ANSI PST file, you should consider using a professional PST Upgrade tool. If you’re receiving an error like, “The Outlook data file has reached the maximum size”, this means you can’t add more data to the PST file. And whenever a PST file reaches its maximum size, users often face serious problems. So it’s better to increase Outlook mailbox size limit. In this article, we’ve learned how to do that by simply modifying the registry. If you’re still using the old ANSI PST format, even then you can increase Outlook mailbox size limit by using the PST Upgrade tool provided by Shoviv Software.